In the middle of the old part of Bamberg, directly beneath the mighty cathedral, one can find the Historical Brewery Tavern Schlenkerla. First mentioned in 1405 and now run by the Trum family in the 6th generation, it is the fountain of Original Schlenkerla Smokebeer, Bamberg's Specialty. The Original Schlenkerla Smokebeer is here at the tavern still being tapped directly from the wooden barrel according to old tradition. "Even if the brew tastes somewhat strange at the first swallow, do not stop, because soon you will realize that your thirst will not decrease and your pleasure will visibly increase." That is written on the coasters, and the coasters are right! They have a really enthusiastic website that really pushes the experience of drinking their beer in the old style Bavarian beer halls. Makes me want to go to Germany. There is very little head with no lacing to speak of and the carbonation is very light. The colour is dark cola, but clear unlike Guinness or other stouts/porters, with deep red hues revealed when held up to the light. Tons going on here. I got heavy smoke, woody, earthy, smoked fish notes, some sourness and primary school pastels (a real testament to the sense of smells ability to revive memories). Light carbonation with a medium bodied mouthfeel. It tastes like it smells and the smoke really stays on your tongue. I was pleasantly surprised to find the beer was a bit dry and gave me that sucking feeling at the back of my mouth that made me want to drink more, which I really didn't expect from my first smoke beer. After the initial blast of smoke the palate makes room for welcome dark chocolate and black coffee flavours in the aftertaste with the smoke floating along the top adding flavour and punch. I'm not experienced with smoke beers and didn't expect to like this as I'm not a huge fan of smoked fish. But I found this brew fully owns it's bold flavours and embraces them, making it very well balanced for such a powerful and unfamiliar set of flavours. It doesn't punch you with the smoke, it's a decent dark ale with smoked overtones. If this was a scotch it would be very peaty like Lagavulin or Laphroaig and if you go in knowing that, you should enjoy this beer as it's very well put together. For the sake of comparision, some months ago I had what was supposed to be a straight up Icelandic stout that featured unexpected and overwhelming smoked fish flavour when it wasn't supposed to. 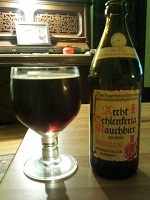 In that case it was gross, in this case the beer delivers what it promises in a very well balanced and flavourful way. Really shows how expectation and delivering on your promises can affect someones enjoyment of your product. There is nothing more frustrating to me than reading a label that makes grand promises and finding none of them fulfilled in the final product, or visa vera, unexpected flavours not talked about on the bottle that are way out of place for the advertised style. I'm not too familiar with the smoked style, but I'll give this beer an A. It was a new experience for me, and in what was a very pleasant surprise, I really enjoyed all it had to offer.